PDX Commons is more than just a condominium building. We are a family of supportive friends in a home with great amenities for all to use. 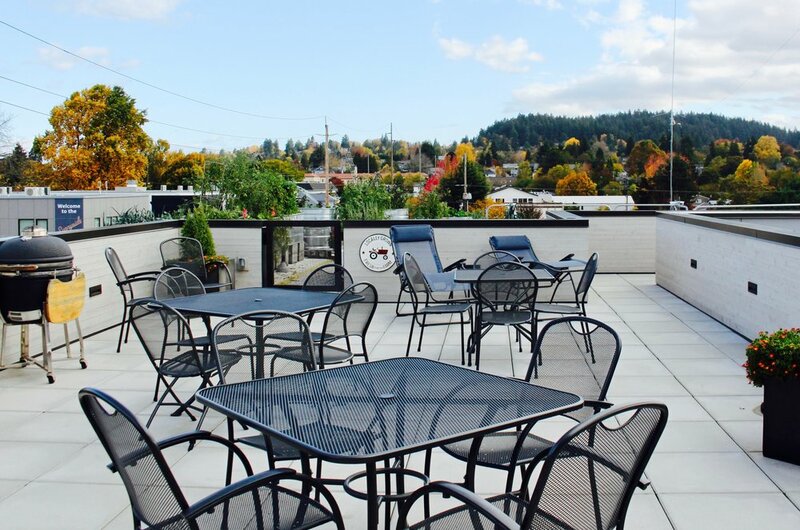 Featuring an interior courtyard, rooftop deck and large common spaces for meetings, meals and social events, our building is an ideal environment for nurturing community and friendship. On the second floor, surrounded by our U-shaped building, the plant-studded courtyard is a place for outdoor meals, parties, happy hour by the fire pit and quiet conversations. Here we enjoy meals, parties, picking fresh organic vegetables from the garden, quiet moments and gorgeous sunsets. This well-lighted space offers workout equipment and crafts tools and supplies, including a sewing machine. Our dining/meeting room can seat up to 50 people. Its sliding glass doors open to the courtyard, and a commercial-style kitchen makes preparing meals easy. The media room boasts a giant TV screen and upholstered leather seating for small groups. It’s also ideal for playing music and meditation. This tastefully furnished space makes for great intimate meetings, social gatherings and quiet times. It includes a fireplace and wet bar.